Cue frantic searching for Robot Wars’ phone number. I’ve got about ten minutes before they close and they’re travelling to the site tomorrow. Luckily, they’re in and are able to reschedule us for 9:30 on Saturday. The weapon is only moving intermittently. With Greg arriving in a few hours, and no idea as to the cause of the problem I’m starting to feel very worried that is going to be a long day. After a lot of inspection I find the BC108 transistors are getting hot, in fact too hot to touch. These are the first stage of a darlington driver and shouldn’t be handling any current to speak of. The base and collector legs of the transistors are connected via 10k resistors to other parts of the circuit. At 12V, these resistors could conduct a maximum of 1.2mA into each transistor, nowhere near enough to make them overheat. After checking everything thoroughly the only thing I can think of is that the 12V linear regulator is generating lots of high frequency noise. I solder a capacitor across the output of the linear regulator to smooth it out, and the weapon works perfectly. However, whether I’ve actually fixed it, or that the transistors have just cooled off while I was modifying it remains to be seen. I’m confident enough that the interface will work for long enough to demonstrate the weapon during the tech check, though. Greg arrives with a small tank. Try to put the top armour on the robot which seems to have shrunk. After fifteen minutes of shoving, ratchet compression and hammering, all eight bolts go in. Ish. Set off for Nottingham. It's been three solid days of sawing, drilling and heavy lifting, so sitting in the passenger seat for an unhurried journey down the A6 is very relaxing. Eat uninspiring but functional breakfast at the hotel and delightedly discover that thieves haven’t broken into the landy and nicked the robot. I have nightmares of finding the robot on sale in the local second hand shop for 50 quid. We arrive at the hangar in RAF Newton. I feel somewhat glad that we’re not the only team whose manufacturing skills are not quite up to Razer’s. Cayene is sitting on the bench in bay 17. Briefly consider taking the top armour off to push one of the drive axle bearings back into place, but think better of it. Manage to push it back into place by sliding a plastic ruler between the wheels and armour. Tech check performed; passes without any problems. Alan Gribble checks the failsafe works OK. It does, but there’s something not right with the rear right speed controller. The zero area on the controller seems to have shrunk to nothing, so it’s hard to persuade it to stop moving completely, and it seems to be sticking in forward drive when it should be going in reverse. The front right wheel is working correctly, so on some occasions we seem to have the wheels on the right hand side rotating in opposite directions; going nowhere fast. Push Cayenne into the loading bay. Realising that the link is on the wrong side, we have to rotate it to put the links in, but it won’t rotate back under its own power due to the same direction problem. Grab one of the spikes and rotate it to face the arena by hand. Drive out into the arena. Get called a tart by one of the tech crew for the message board. Up in the competitor booth, Cayenne decides to start playing and works perfectly. We drive over to the far corner of the arena and do a few test maneuvers, and spin on the spot a bit to turn the message board to face the judges. No problems. Here goes nothing. Horn sounds. Drive immediately over to the other side of the arena, so we have our backs to Disconstructor. They follow and we move backwars to ram them, miss them and we end up side by side, trying to turn around each other. We break off and move out halfway down the arena to get enough room to build up for another ram on Disconstructor. But something’s wrong; we’re not moving fast enough, and soon enough we were stopped completely. Frantically shake the controller and transmitter but we’re not going anywhere. Disconstructor move in for the kill and our message board is wiped out instantly (8mm polycarbonate). They circle around and take another swipe at the front of the robot, knocking the crusher jaws back into the frame of the robot, and smack a final hit on the right side of the robot. Cease is called. 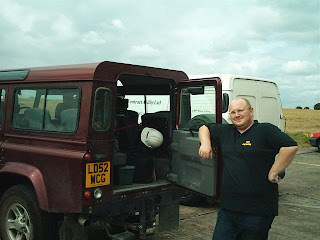 The time from us being immobilised to being hit by Disconstructor was very small, so I think the damage they dealt out was fair. Kim Davies bulldozes Cayenne out of the arena. One of the judges (I think) asks us if we can repair it, which could have meant a discretionary place was on the cards. But from the look of things we’re not going to be running again this week. Quickly surveying the damage, it doesn’t look like any of the internals have been badly damaged. Two of the rear spikes have been ripped off, the linear actuator’s clevis has been sheared off and one of the chassis beams has been bent, putting the right front axle out of alignment. We didn’t notice for quite a while that one of Disconstructor’s teeth was still stuck in our armour (highlighted on the picture to the right). Disconstructor said the teeth were such a hard grade of steel that they couldn’t angle grind them, so I considered it quite an achievement that we’d managed to break one of them off. It took a lot of persuasion with a 4lb hammer to remove it. We had been extremely lucky with the speed controllers. One of our interfaces, which are mounted inside the speed controller enclosure, had been hit and the interface microprocessor was cut clean in half. I’m used to getting segmentation faults in my programs, but not quite this severe. Another inch and they would have cut the speed controller in two. The interface comprises less than ten pounds worth of components, so we had a lucky escape there. As far as I could tell both halves of the robot were working fine until we lost power. This means we probably had a ‘common mode failure’ - a fault in the design of each system rather than a random component failure. A gradual reduction in power would be what you’d expect from a flat battery, but all the batteries were still pretty much fully charged - we measured them at about 12.7 volts each after we’d got them home. The most likely culprit I can think of at the moment is the darlington driver circuit which holds the speed controllers’ ignition relays on. The circuit is identical to that used in the weapon interface, which we knew was overheating. On previous tests (when we’d been running for a good five minutes) we were running without the top armour on, so the ventilation would have been much better. This is just theory at the moment, we haven’t had time to retest everything. I never did find out what was wrong with that incarnation of Cayenne. Two of the speed controllers were found to be broken; the other two are still in Cayenne to this day and the broken ones were replaced with a RoboteQ controller. I could have done better given an extra day to tune up and debug, but that is always the case. 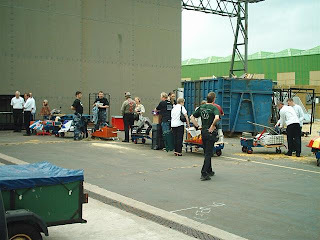 No further series of Robot Wars were filmed, so I never got a chance to have another go. Still, I’m very glad I got to stand in the famous booth with a working robot, if only for a short while. It’s very tempting to give up the night before a fight, when nothing seems to be working and you’re covered in cuts and grazes from rapid, haphazard metalwork. 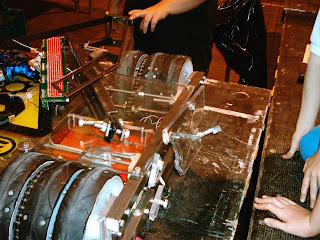 Disconstructor unfortunately drove into the pit in the first televised round. It was a good robot which could have gone a lot further with better luck, but it would have been nice to get knocked out by someone better recognised. 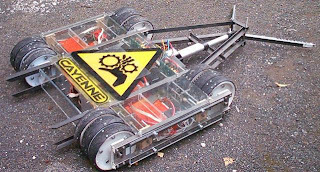 Cayenne was dismantled after the fight and rebuilt with a completely new chassis as Jalapeno. It went on to fight at Magna and held its own quite well in a one-on-one fight with Tornado at Preston.